Apolol Electric Vacuum Suction Blackhead Remover to Care Your Skin. 1.The product can be charged for 8 hours at most. 2.When being charging, the red light keeps on, the charging process is completed, the light will turn into green. 3. When the battery drain out, the red and green light will blink for 10seconds and die out automatically. 4.The device can not be turned on when charging. Step 1: Before using on face, use it on your hand to know the suction firstly. (Sensitive and dry skin always use the 1-2 suction level and small beauty head). Step 2: Use hot towel or steamer or exporting liquid (Highly recommend) to open the pore. 【4 ADJUSTABLE SUCTION FORCE WITH ONE BUTTON DESIGN】Vacuum Physical Suction Design from level 1 to level 4 suction force, you can adjust the force you like to cure your pore. One-click design to change the force and long press to shut down the device. 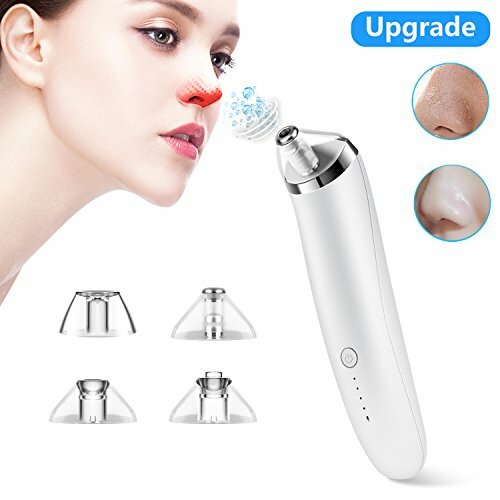 【4 Replaceable Suction Heads for All Types of Skin】Small sucker: Remove blackhead, weaker suction, which is suitable for sensitive skin; Large Hole Head: stronger suction, which is suitable for stubborn blackhead; Elliptical Hole Head: make your skin more elastic and compact perfect for T zone. Microdermabrasion head: exfoliating keratin and dead skin, desalt scar. 【USB RECHARGEABLE & PORTABLE】 Conform to the principles of human body engineering and handhold design. This electric skin cleaner blackhead extraction tool owns wireless design. With USB charge cable, one time charge can support superior standby time. with the size of 7.4*1.7*1.6 in, you can enjoy your professional SPA skin care at home or travelling. 【IMPORTANT TIPS】 Use this Blackhead Vacuum Suction Remover for twice a week. Please use the low level suction at the first time use. When it's working, please move quickly and do not stay in on place more than 3 seconds. Please Don't stay on Same place too long to prevent red and purple skin. If you have any questions about this product by OTBBA, contact us by completing and submitting the form below. If you are looking for a specif part number, please include it with your message.